(Editor Note: John Bianco from the University of Texas passes this along on one of the top sports movies of the year). A major motion picture celebrating college football, character and competition is set for a national release this Friday, Nov. 13. 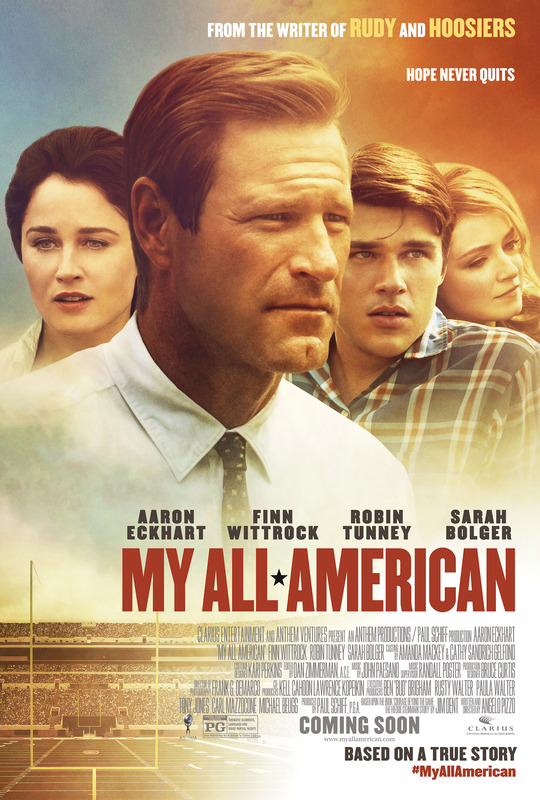 “My All American” shares the inspirational true story of University of Texas football legend Freddie Steinmark, an underdog who played a critical role on Coach Darrell Royal’s 1969 National Championship team. Written and directed by Angelo Pizzo, the writer of iconic sports films “Hoosiers” and “Rudy”, the film tells the tale of one of Royal’s most beloved players who always put family, team and school first. In the end, Freddie leaned heavily on the support of his coach and teammates when faced with a life-changing challenge. Crafting a realistic story was a critical element in the planning of this film. Many of Steinmark’s Longhorn teammates and the critical characters in the film were on set helping ensure that the film was authentic. Former Texas quarterback Colt McCoy served as a football consultant while his brother, Case, played Arkansas quarterback Bill Montgomery and UT All-American Jordan Shipley played Longhorn wide receiver great Cotton Speyrer in the film.